Have you taken a good look at the skincare and personal hygiene products in your bathroom cabinet – in particular at the ingredients in them? My guess is that you’ve got stacks of such exfoliant products as facial scrubs and body polishes. You’re sure to have toothpaste. Unless you’ve got dentures of course. In which case, perhaps you should have paid heed to that well-known Pam Ayres ditty about dental hygiene? The chances are that a good number of these products achieve their scrubbing power from the inclusion of microbeads. What are microbeads and why should you care? 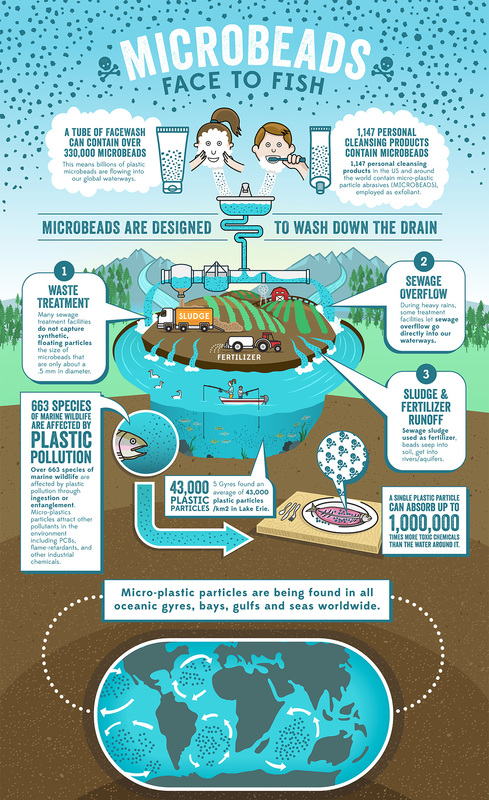 Microbeads, as the name implies, are miniscule bits of plastic used by manufacturers in a vast range of products. Spherical in shape they range in size, according to this article from Forbes, from 1 millimetre (about the size of a pinhead, to 1 micrometre – too small for the naked eye to see. According to the United Nations Environment Programme, a typical exfoliating shower gel might contain as much plastic, in microbead form, as the container itself. Gulp! That’s a lot of plastic in one small product huh? So what’s the problem with them? Described in somewhat lurid style by Greenpeace as ‘gross, polluting plastic’ these microbeads are wreaking havoc on the environment. And they’re not doing much for your digestive system and all-round health either. Each time you shower or brush your teeth or use some household cleaners these itsy bitsy teeny-weeny plastic spheres go swooshing down the drain. And our poor old Victorian sewage systems are not cut out to filter them out. We’re all aware now that our oceans are metaphorically drowning in tonnes of plastic waste: bottles and bags and more. All this plastic is ugly and damaging to the marine environment and the creatures that live from it. It often ends up in the stomachs of all manner of marine life. And microbeads are adding to the problem. Thus, what may seem innocuous on the face of it (literally if it’s your face wash they’re in) is causing untold harm. It’s not only seagulls that are suffering for your complexion and your pearly whites though. You yourself are not only smothering yourself in them, you’re eating them too. Both directly – when you brush your teeth – and indirectly when you eat fish and seafood that have ingested microplastics and the toxins associated with them. And that takes some stomaching! Greenpeace have a super infographic that illustrates the issue well. Well yes – there are. This article from Elle points out that such major cosmetic companies as Johnson & Johnson, Unilever and Proctor & Gamble have promised to make the move to natural alternatives to microbeads. But, as Elle states, that switch could take years. In the meantime though there are alternatives to look out for or to make yourself from store cupboard ingredients – many more than those listed here. Lemons, yoghurt and sugar can all be used to make exfoliants. Not only a healthy breakfast, oats are a gentle exfoliant ideal for sensitive skin. Oats, as we know, soak up milk to make porridge. In the same way they soak up excess oil on the skin. Grind them in a blender and add to water to make a paste. Not known for its gentle touch salt scrubs are best used on rough body and feet skin rather than your face. Salt is one of Mother Nature’s great detoxifiers that will unblock your pores, get your circulation going and tighten your skin. Notable for treating cellulite, coffee as an exfoliant is no has bean. It also works well on stretch marks and feet and stimulates blood flow. It’s interesting that jojoba beads are sometimes mistaken for microbeads. Made form from jojoba oil they are biodegradable. Broadly speaking jojoba is a shrub native to the southern end of the United States and the northern end of Mexico. The native Americans knew of jojoba’s soothing and moisturizing properties and used it to treat sunburnt skin. Many over-the counter products use jojoba for these moisturizing properties and its stability. The biodegradability of the Jojoba bead is a big bonus. They are also, as this article points out, a good choice for consumers with an allergy to nuts. And they feel as good when applied to the skin as they look! Swindon-based Carol Aplin is the founder of Pink&Green. Founded in 2014, Carol brings her many years of experience as a holistic therapist to the products she makes. It’s Carol’s belief that products should help you to both look and feel wonderful. Pink&Green’s first product was an organic facial skincare ritual. As you can imagine there’s no place for nasty plastic microbeads in the Pink&Green facial exfoliator. Instead they use jojoba beads for much the same reasons as other producers of beauty products: because they clean with a gentleness of touch lacking in many other exfoliants. And because they don’t damage the skin, leaving it open to bacteria. Pink&Green combine the jojoba beads with shea butter and sunflower oil for a beautiful creamy consistency. Carol says: ‘When I’m creating a product, I look to nature for answer to the problem I want a product to solve. We are all, after all, made up of the same elements.